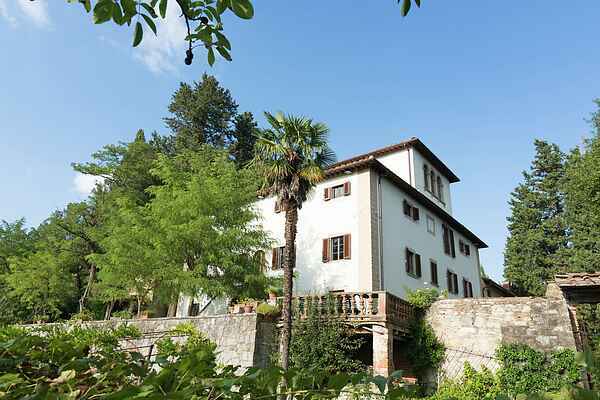 If you wish to spend some time in Tuscany in the best way possible and experience the feeling of belonging in this beautiful spot, no other guests around, historical Villa (early 17th Century)is the place to be. The house sits high on a hill in the rural Arno Valley and, although it is only 24 km from Florence's historical centre it enjoys commanding views over the surrounding Tuscan countryside. The villa is arranged over three floors accomodates up to 14 people in great charm and comfort. The well maintained gardens overlooking the rolling Tuscan hills, offer an oasis of peace and tranquility. There’s a dining area and sun terrace, large swimming pool, hammocks for those who prefer the shade, an enchanting orchard and vegetable garden. For those who like to shop, they will be happy to find the famous high-fashion luxury outlet 'the Mall' at only 3 km from the house! Ideal environment for a cycling holiday! On site bicycle rental / assistance possible.